This Casa Loma Avenue near White Rock Lake is on the 2018 AIA Dallas Tour of Homes Oct. 20-21. Tickets can be purchased online at hometourdallas.com. I am honored by the opportunities Maestri Studio is given time and time again to balance maintaining the character of a neighborhood while modernizing the home to remain fresh and livable for today’s standards. One of my favorite examples of this is our project on Casa Loma Avenue near White Rock Lake, and I’m proud to see it featured on the 2018 AIA Dallas Tour of Homes Oct. 20-21. What makes this project unique is its historic context. In 2016, just as real estate prices and construction costs began to surge, we were hired to start design on the quirky 1938 split-level home. While the original home in Lakewood Hills more than likely would have been considered a tear-down by some these days, we saw the potential and understood why the owners were proud to call the house their home. This renovation was a labor of love by its owners — they wanted to preserve both the original charm and the scale of the home, but also open the floor plan with a Scandinavian-inspired modern design. We evolved the original two-bedroom, 1,690-square-foot home into a 3,300-square-foot, three-bedroom home with two living areas. The modern floating staircase, floor-to-ceiling windows and doors, and a black painted exterior all serve to make the home stand out among the white homes all around. During the past 14 years, I have designed both renovations and new constructions in East Dallas. My firm works hard to maintain the charm of area, but also keep it relevant and appealing to its residents. Building scale is as delicate a subject for the neighborhood as it is difficult to balance in designs. 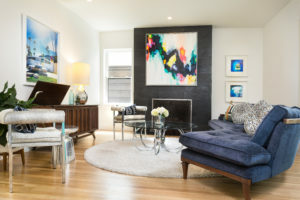 Our goal is to make each new and remodeled home feel like a one-of-a-kind complement to the fabric of the neighborhood. We see our Casa Loma Avenue project as an example of what many architects, designers and urban planners have identified as a community need: to provide designs and construction that are diverse and affordable and support walkable communities with access to public transportation. We also see Casa Loma as a great example of how smaller and older homes can be saved rather than razed. While most of the home was reconstructed, the original 1930s home is still there with elements of its original quirkiness and spirit. As a resident of Lakewood Hills, I hold East Dallas neighborhoods dear to my heart. I like putting a modern spin on classicism, pulling ideas from a variety of styles to make a home feel original and, ultimately, bringing our client’s visions to life. I hope you’ll come on tour to see for yourself what the buzz is all about. The AIA Dallas Tour of Homes, Dallas’ only citywide home tour and the area’s only tour curated exclusively by architects, returns Saturday and Sunday, Oct. 20-21, 10 a.m. to 5 p.m. The two-day, open-to-the-public tour highlights the work of some of the city’s most talented architects and the area’s most innovative and outstanding residential design. Tickets can be purchased online at hometourdallas.com or can be purchased during the tour at any of the homes. Tour-only tickets are $25 in advance, $30 the weekend of, and $10 to visit an individual home. The catered Premiere Party is Thursday, October 18, set in a home exclusively available to party attendees and not on the tour. Tickets to the Premiere Party are $100 and include one ticket to the home tour.